Trump International Hotel & Tower® Chicago provides a unique opportunity to own an elegantly appointed hotel guestroom in the heart of downtown Chicago. These superb accommodations may be purchased for personal or corporate use. When in residence, owners will have full access to the five-star amenities and services of a luxurious hotel. When not occupied, ownership of your guestroom may include the opportunity to place your unit in a rental arrangement. Hotel condominiums range from in size from approximately 600 square feet to over 2200 square feet in size and floor plans feature studios, one-, two- and three-bedroom units. Full kitchens and spa bathrooms with soaking tubs and separate showers in every floor plan ensure that the hotel condominiums at Trump International Hotel & Tower® Chicago offer all of the comforts of the city's premier residences. Additional features of hotel condominiums include a private owners closet in each unit and in-mirror televisions in each bathroom. Enjoy the luxuries of Chicago's foremost hotel, including 24-hour room service, daily cleaning and turndown, and gracious customer service in your personal hotel condominium. While you are not in town, rest assured that your home in Chicago is cared for and worry free! Each hotel guestroom is purchased is fee simple, which owners may sell or transfer at any time in the future. 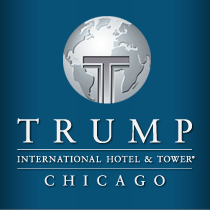 Trump International Hotel & Tower® Chicago serves as the perfect in-town pied a terre for those who would like a home in town without the responsibility of maintaining a residence. Whether an owner occupies the unit or places it for rent, the hotel will manage and maintain all guestrooms, providing the highest level of service in the most exclusive surroundings. Trump International Hotel & Tower's intimate and private ambiance and award-winning service coupled with world class design ensures an absolutely luxurious lifestyle.